Part 27 of my youtube countdown rolls on with another act from the infamous Rock and Roll Circus. This time, we have Dirty Mac. Who is Dirty Mac? 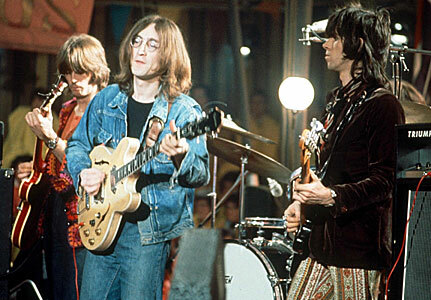 Well, its John Lennon, Eric Clapton, Keith Richards (on bass, awesome), and Mitch Mitchell (on drums direct from the Jimi Hendrix Experience.) A super group if there ever was one, and my God, do these guys utterly rock the universe. They are playing Yer Blues, a jam John cut that year (1968) on the White Album with the Beatles. The Beatles, outside a few exceptions, could never really be seen playing music from this era, so this clip gives you a delicious taste of what a mind blowing experience it would have been if the Beatles toured the White Album. Because youtube is horrible, they’ve broken up Mick and John’s hilarious intro video for the Dirty Mac, but don’t worry, I’ve included both the intro, and the searing performance. I don’t know how else to describe the incredible majesty of these clips, so please, just sit back, hold onto your seats, and watch…over and over! Powered by WordPress v 5.0. Page in 0.436 seconds.